Fiction, not Gordon, but I couldn’t resist. OK, it has been a while (again! ), but I’m back and this time I have a little list of places for you to send your fantastic flash fiction. While I haven’t actually tried any of these outlets myself, they look like stellar publications and I certainly plan to submit to each of them in the near future. So, if like me you spent the colder months of the year writing, why not take advantage of the fact that it’s now (finally) spring and get some of it out there! First up is Nanoism, and billing itself as “a place for twitter fiction” it should be a prime target for all your micro-shorts. Nanoism is “the longest running twitterzine”, and they pay their contributors! You leave the perfect amount of water in your nightstand glass each morning to feed my orchid. He spoke in a harried whisper. About things he’d seen. About fears that tightened his stomach like a vise. On the other end, a dial tone. Although submissions are limited to Twitter’s strict 140 character length, Nanoism accepts all genres with a particular interest in literary fiction, so there’s really nothing to stop you from giving them a go. Besides, the challenge of writing twitfic can be fun (I previously blogged about it here and again here), you retain all the rights to your story and you even get paid! What’s not to like? Get writing now people, and then get it in to Nanoism.net! At last look they were accepting unsolicited stories all year round, but make sure to check out their submissions page for latest info and guidelines. Also, they have a Twitter account (obviously!) @nanoism, and welcome tweet-based contact. Next up is Flash Fiction Magazine, a website that publishes one flash story a day, delivering it straight to reader’s inboxes, while also publishing the occasional ebook collection of the very best submissions. Accepting stories between 300-1000 words in length, Flash Fiction is open to all genres except erotica (adult themes/content are/is fine in service to an actual story), although they also mention that children’s fiction probably won’t find a home on their site. Apart from that, have at it! Once again, you retain all the rights although it is important to note that they will not accept previously published works, and yes – your blog counts. So be careful. While I am definitely a fan of micro flash, there is no doubt that the larger word limit at Flash Fiction Magazine allows for some great character/world development and I would strongly encourage you to check out their website and read some of the stories there whether you plan to submit or not. You won’t be disappointed. Have a look at their submissions page for all the latest info for writers, and you can tweet at them here: @flashficmag. Finally, there’s NANO Fiction, a “non-profit literary journal that seeks to cultivate the genre of flash fiction by creating opportunities for emerging writers to achieve national recognition through [their] website, print publication, and educational events.” Wow! Founded in 2006, NANO is both an outlet for flash fiction authors and a resource for writers and readers everywhere publishing regular musings on the state of flash fiction in the world today which are definitely worth a read. In addition, their website hosts writing prompts and competitions as well as monthly featured stories showcasing some of the very best flash out there. With both print and e-versions of past issues available, NANO accepts submissions under 300 words in any or no genre but, for their 10th edition, they are especially on the look out for work that explores “milestones and transitions”, experimenting with form while still balancing narrative. Check out their online catalogue for some inspiration and a lot of fun reads (you’ll have to dig through the events listings to find the stories/readings, but they are there). In addition, NANO also host the NANO prize, currently open for submissions and with a first place prize of $1000. Not too shabby, eh? Their submission page with details of both the NANO prize and their general submission rules can he found here: http://nanofiction.org/submit And you can follow them on Twitter here: @NANOFiction. That’s all for now, internet. *Obviously (I hope!) all of the stories quoted here are used in this blog post in good faith with no claim to copyright. They remain the property of their respective authors/publishers. Pint-Sized Plays – Get Involved! About a week ago, I blogged about the launch of Pint-Sized Plays in Portsmouth, NH, which opened with a play co-written by me. Well, now I’m back to tell you that Pint-Sized Plays was a huge success and has found a permanent home in the red door bar and lounge. What’s more, they are keen to hear from you with your ideas for short performance pieces that could form part of the Pint-Sized Plays 2015 line-up. You don’t have to be in Portsmouth to take part but if you are, they are having a series of informal ideas sessions which sound like a great way to meet new creative-types. 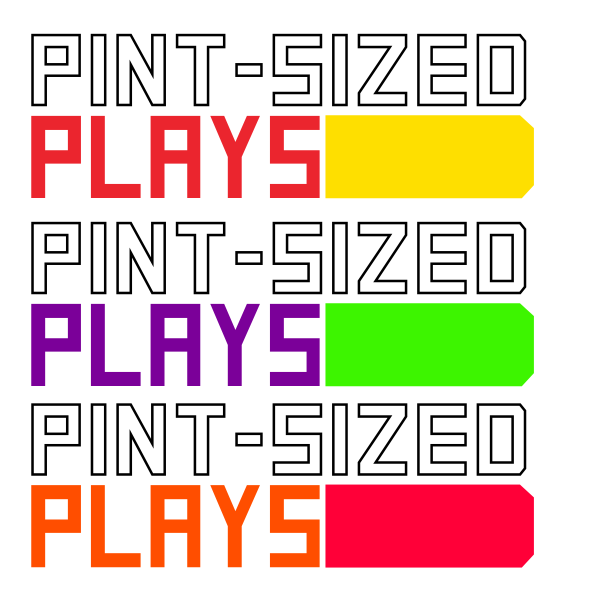 Check their out the Pint-Sized Plays website for more info and sign up for the ideas session via their Facebook page. They have a great team of writers, producers, directors and actors working on this and it’s a brilliant opportunity for people to get involved with innovative, grassroots theater and potentially see your own work onstage. I certainly plan to write for them again in future – why not give it a go yourself? Well, that’s all for today. TTFN everybody, and DFTBA!